Scandalized by the misery that he had found in the poorer classes of the powerful French nation, Thomas Jefferson wrote to Madison, informing him that this was the consequence of the “unequal division of property.” France’s wealth, thought Jefferson, was concentrated in very few hands, which caused the masses be unemployed and forced them to beg. He also recognized that “the equal distribution of property is impracticable,” but acknowledged that marked differences led to misery. If one wanted to preserve the utopian project for liberty in America, no longer for reasons of justice only, it was urgently necessary to insure that the laws would divide the properties obtained through inheritance so that they might be equally distributed among descendants (Bailyn 2003, 57). Thus, in 1776 Jefferson abolished the laws in his state that priveleged inheritors, and established that all adult persons who did not possess 50 acres of land would receive them from the state, since “the land belongs to the living, not the dead” (58). Jefferson once expressed his belief that if he had to choose between a government without newspapers and newspapers without a government, he would choose the latter. Like the majority of his founding peers, he was famous for other libertarian ideas, for his moderate anarquism, and for an assortment of other contradictions. Ron Paul: Carrying Jefferson’s torch in a hostile environment? Maybe nowadays Ron Paul is a type of postmodern incarnation of that president and erudite philosopher. Perhaps for that same reason he has been displaced by Sarah Palin as representing the definition of what it means to be a supposedly good conservative. In addition to being a medical doctor, a representative for Texas, and one of the historic leaders of the Libertarian movement, Paul is probably the true founder of the non-existent Tea Party. If anything has differentiated neoconservative Republicans from liberal Democrats during the last few decades, it has been the former’s strong international interventionism with messianic influences or its tendency to legislate against homosexual marriage. 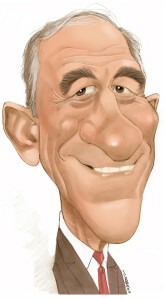 On the other hand, if anything has characterized the strong criticism and legislative practice of Ron Paul, it has been his proposal to eliminate the central bank of the United States, his opposition to the meddling of the state in the matter of defining what is or should be a marriage, and his opposition to all kinds of interventionism in the affairs of other nations. A good example of this was the Republican Party debate in Miami in December of 2007. While the rest of the candidates dedicated themselves to repeating prefabricated sentences that set off rounds of applause and stoked the enthusiasm of Miami’s Hispanic community, Ron Paul did not lose the opportunity to repeat his discomforting convictions. In matters of its internal politics, the Libertarian movement shares various points with the neoconservatives, for example, the idea that inequalities are a consequence of freedom among different individuals with different skills and interests. Hence, the idea of “wealth distribution” is understood by Ron Paul’s followers as an arbitrary act of social injustice. For other neocons, it is simply an outcome of the ideological indoctrination of socialists like Obama. Subsequently, they never lose the opportunity to point out all of the books by Karl Marx that Obama studied, apparently with a passionate interest, at Columbia University, and all of the “Socialist Scholars Conference” meetings that he attended (Radical-in-Chief: Barack Obama and the Untold Story of American Socialism, Stanley Kurtz). Nonetheless, according to the perspective of the libertarians, all of this would fall within the rights of anyone, such as smoking marijuana, as long as one doesn’t try to impose it upon everyone else, which in a president would be at the very least a difficult proposition. The sacred cow of neoconservative North Americans is liberty (since according to them liberalism is a bad word), as if it had to do with an exalted concept separate from reality. In order to attain it, it would be enough to do away with or reduce everything called state and government, with the exception of the military. Hence, the strong inclination of some people for keeping guns in the hands of individuals, so that they can be used against meddling government power, whether their own or that of others. Fanatics for total liberty either do not consider or minimize the fact that in order to be free, a certain amount of power is needed. According to Jefferson and Che Guevara, money was only a necessary evil, an outcome of corruption in society and a frequent instrument of robbery. However, in our time (the Greeks in the era of Pericles already knew this), power stems from money. It is enough, then, to have more money in order to be — in social rather than existential terms — freer than a worker who cannot make use of the same degree of liberty to educate his children or to have free time for encouraging his own personal development and intellectual creativity. At the other extreme, in a large part of Latin America, these days the sacred cow is the “redistribution of wealth” by means of the state. The fact that production can also be poorly distributed is often not considered or is frequently minimized. In this case, the cultural parameters are crucial — there are individuals and groups who create and work for everyone else and who therefore cry out because of the injustice of not getting the benefits that they would deserve if social justice existed. Which is as if a liar were to hide behind a truth in order to safeguard and perpetuate his vices. According to this position, any merit is only the outcome of an oppressive system that doesn’t even allow the idle to put their idleness behind them. So, idleness and robbery are explained by the economic structure and the culture of oppression, which keep entire groups shrouded in ignorance. Which up to a certain point is not untrue. However, it is insufficient for demonstrating the inexistence of perpetual bums and others who are barely equipped for physical or intellectual work. In any case, there should not be redistribution of wealth if there is not first redistribution of production, which would partly be a redistribution of the desire to study, work and take on responsibility for something. These days, states are necessary evils for protecting the equality of liberty. But at the same time they are the main instrument, as those revolutionary Americans believed, for protecting the privileges of the most powerful and for feeding the moral vices of the weakest. Washington University Political Review >> Washington University. Translated by Dr. Joe Goldstein, Georgia Southern University. Price of Internet freedom? Eternal misquotes.